When you go grocery shopping you have a number of choices to make. You choose the food product(s), the brand of each food product and how much of each food product you want to buy. If cost is more important to you than buying a specific brand, you may consider picking your product based on whether it is the best buy or not. The easiest way to determine the best buy is to look at the unit pricing (cost per unit of measure) to compare the cost of different brands or sizes of the same product. 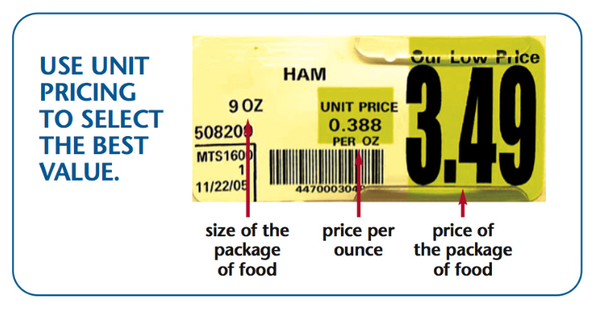 Most stores have the product unit pricing on labels on the shelf that holds the product. The unit pricing [unit of measure] is usually figured by ounce (oz.) or by pound (lb.) and reported as cost/ounce or cost/pound. Figure 1 is an example. Example 1. The easiest example of comparing products to get the best buy is if you have two different brands of the product, and they are the same size (weight/package). Say, for example, both products weigh 8 ounces. Here you do not need unit pricing. Since they are the same size, you will just pick the one that costs the least, and it will be the best buy. The 10 oz. package is the best buy even though it costs more overall. What if you only need 8 oz. and don’t think you will ever use the extra 2 oz., should you still buy the ‘best buy?’ No, if this is a concern, then of course buy the lesser amount to avoid wasting food and money. What if the store does not provide the unit pricing, can you figure this out yourself? Yes. For the 10 oz. bread sticks with a total price of $2.80, divide the 2.80 by 10, and you will get 28 cents per ounce. Take the 8 oz. bread sticks with a total price 2.32 cents, divide the 2.32 by 8, and you will get 35 cents per ounce. So you know that the 10 oz. package is the best buy. What if the store provides the unit pricing, but does so in different denominations, can you still use unit pricing? Yes, but you will have to do some figuring. You will need to convert both products’ unit pricing to the same denomination, — so convert both to cents/lb., or cents/oz., or dollars/lb. or dollars/oz — before you can compare them and determine the best buy. What if you have a $0.50 coupon for only the 8 oz. product. Would that make a difference? Subtract the $0.50 from the original $2.32 which = $1.82 and then divide the $1.82 by 8 oz. to get the new unit price of $0.2275 or $0.23 per ounce. It does make a difference. Now the 8 oz. product is the best buy. What if there is a huge sale on the largest package that is much larger than you need at the present time? Check to see if the unit pricing of the sale price shows that you will save by buying in bulk. If so, consider if you want to buy a large amount of the product. If buying in bulk means you will have to store some of the product, you may want to reconsider based on your storage ability and whether you will want to use the product again. Look at the sell by date and determine if you will be using it up by or soon after that date. Also, some products won’t be as easy to store safely once the package/container is open. Some products do not store well even when left un-opened, such as flour, cornmeal and jello, which can get ‘buggy’ when stored in the cabinet for a long period of time. Some products can become rancid or off-flavor when saved for too long. A best buy is only good when you can use it all up. Figure 1. A unit pricing label.